I left the Outer Banks of North Carolina on Thursday, 4/16/15, and the town of Lewes (Pronounced “Louis”) in Delaware became my next firm destination.  FYI: The peninsula that Virginia, Maryland and Delaware all share is known as Delmarva. 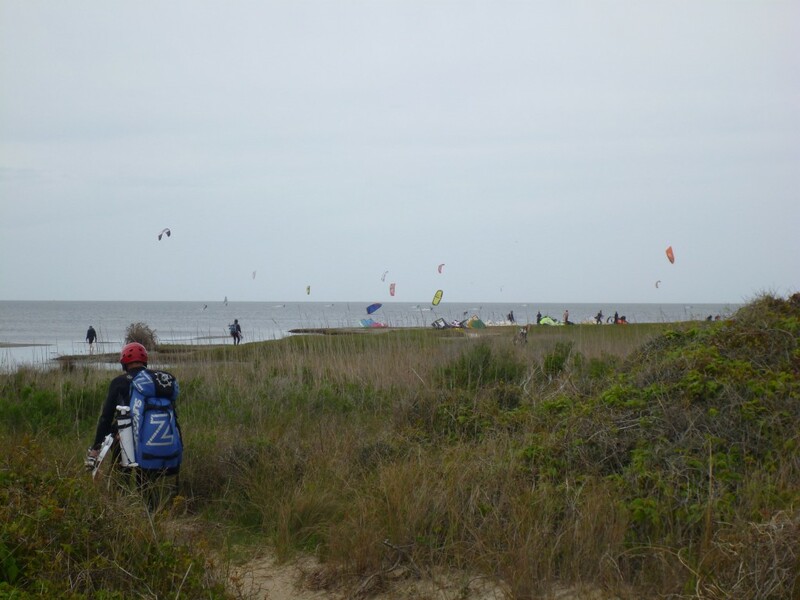 There is a serious wind surfing scene in North Carolina. 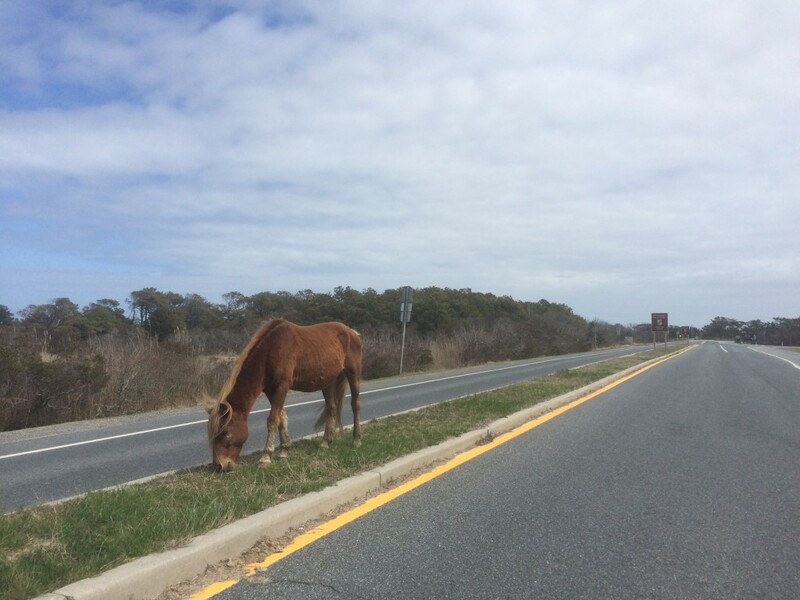 I stopped at Assateague Island National Seashore (site / wiki) in Maryland to see the wild horses. 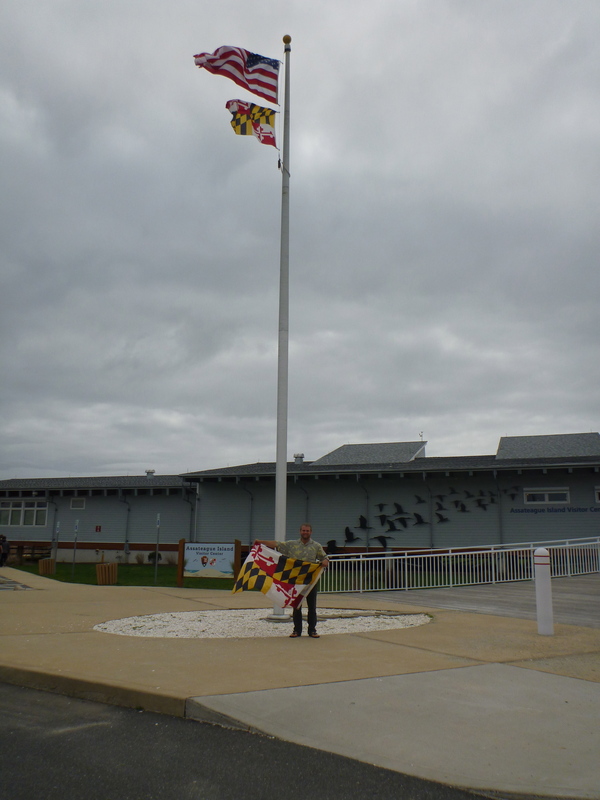 The rangers at the Assateague Visitor Center were able to switch flags with me too! They gave me a used one from the back instead of the one on the pole, but hey – a flags a flag! My mother’s friend from high school lives in Lewes, and he would be disappointed if I didn’t make it known that not only is Delaware the oldest state in the Union, being admitted in December of 1787, but Lewes is the oldest city in Delaware, being founded in June 1631. Bill, Anita (my mom), and I all went to Foothill High School, so he and I had fun trying to remember the lines to our fight song and stuff like that. 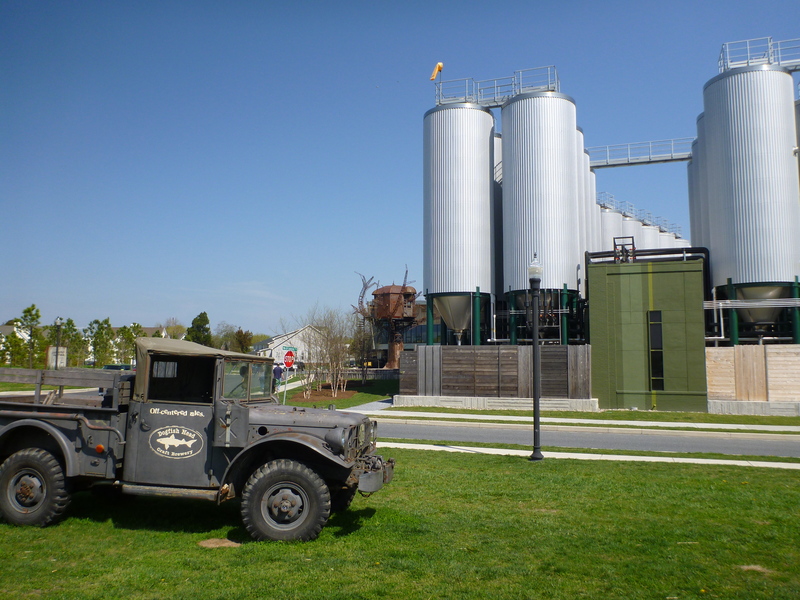 He and his wife, Nancy, recommended a few different things to do in the area, but my ears latched on to the free brewery tour at Dogfish Head. I arrived 10 minutes before they opened, and it was already crowded. I barely got my name on the 4th tour of the day. No worries though, the brewpub is a cool hangout. They give you a ticket for four free samples, and there’s corn hole and bocce ball out front. The only unique insight I would have into the actual brewery is that it looks like they have a very well controlled process. 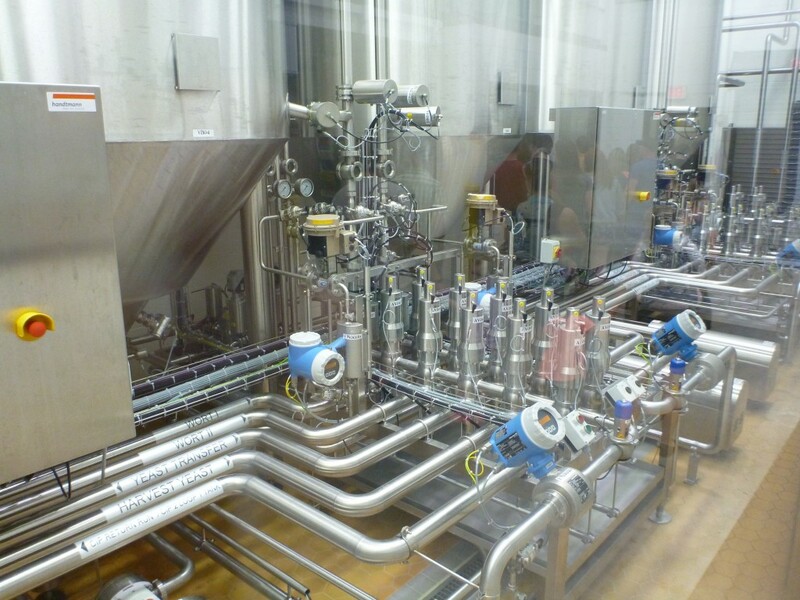 What I mean is that they had a lot of sensors for things like temperature, flow rate, and pressure, and a lot of control elements like valves to pinch down on flow or to change the flow route entirely, all of which were capable of being viewed or operated remotely. As a result there was much more wiring throughout the brewery than I’ve seen other places. They didn’t show us the control center on the tour, but I imagine their SCADA monitors might look similar to what I saw as a petroleum engineer. The blue things are sensors of some sort. Back in Lewes, my hosts made sandwiches to go, and we all went for a bike ride in Cape Henlopen State Park. 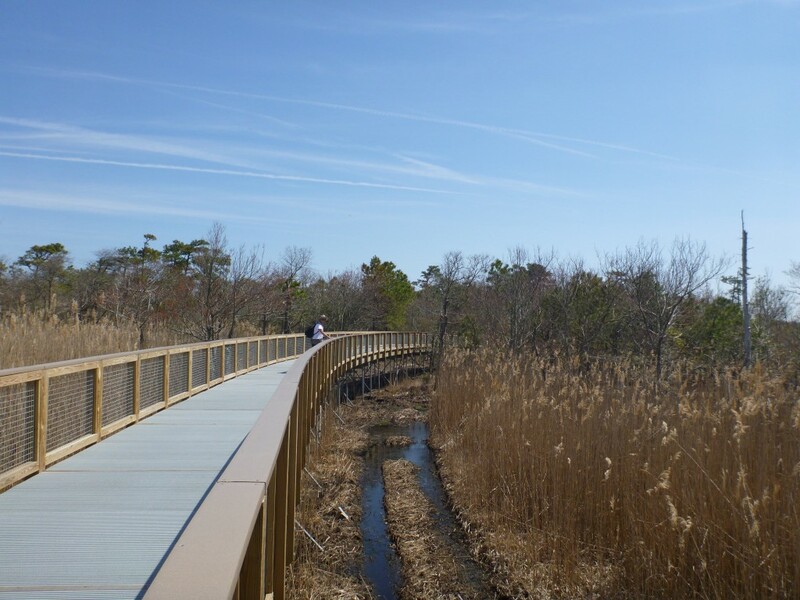 The recently completed bike path followed the edge of the shallow wetlands and tall grass of Rehoboth Flats. It ended in a neighborhood art gallery where we hung out for a minute to catch our breath before heading back. Tall concrete cylinders, 20 feet in diameter and 40 feet tall, appear at regular intervals along the coast line. These pill boxes used to serve as U-boat lookouts during WWII. I left Delaware Sunday, 4/19/15, and began driving to Gettysburg, Pennsylvania.